Emma Rose has a secret; she has a designing alter ego named Allegra Biscotti. Thanks to Paige Young, senior editor at Madison, Emma’s clothes have already been featured in a magazine. Only a few people know that Emma is Allegra; she hasn’t even told her best friend Holly. But, then the unthinkable happens: Allegra is asked to design a Sweet Sixteen dress for Rylan Sinclare, the most fashionable and popular girl at Emma’s school. Plus, she scores an invite to the party and is in the know about all of the details. As Holly gets more suspicious of her behavior, Emma must find a way to design a dress both of her clients will love while staying true to herself. 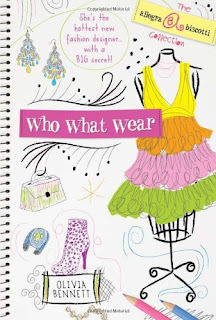 Who What Wear was just as fun to read as The Allegra Biscotti Collection. 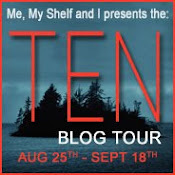 I liked that the author upped the stakes for Emma, so that this sequel didn’t follow the same exact plot arc as the first book. Emma thought there was pressure before, but now not only does she have to deal with school and designing (she’s going to be one of ten designers showcased in a Madison sponsored pop-up shop), but she’s been commissioned to design a dress for Rylan. To keep her identity secret, Emma poses as her own intern! With regards to Allegra, Emma and Charlie (her only friend that knows the Emma is really Allegra) became more of a team as they each work on different aspects of the her image and brand. Their personalities complemented each other and their interactions were always fun to read. Even though, Who What Wear is a sequel, it can be read as a stand alone because information about specific plot points from the first book is sprinkled through out the story. 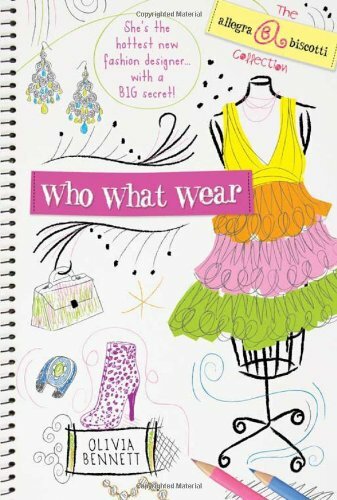 In fact, as someone who read The Allegra Biscotti Collection right before reading Who What Wear, I was grateful that there wasn't a recap at the beginning. Instead the opening scene sets the stage for the rest of the book, by introducing new characters and reminding the reader about Holly and Emma's friendship. Speaking Holly and Emma, their friendship, and its ups and downs, felt very realistic. Ms. Bennett did a great job of portraying middle school politics and balancing it with the other side of Emma's life. Tweens and teens who love fashion and dream about being a famous designer will enjoy reading Who What Wear just as much as The Allegra Biscotti Collection. I would wholeheartedly recommend it to readers who enjoy contemporary novels with just a dash of dare to dream big ambition.